By invitation of Julia Howard, the assistant curator, we recently popped down to Haslemere to view an unusual item in their reserve collection: a small (15” diameter) plaster copy of the original Tizoc Stone. 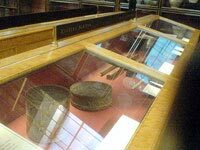 It was gifted to the museum in 1919 by a Lady Erskine, but how and why it should end up in Haslemere is a bit of a mystery! 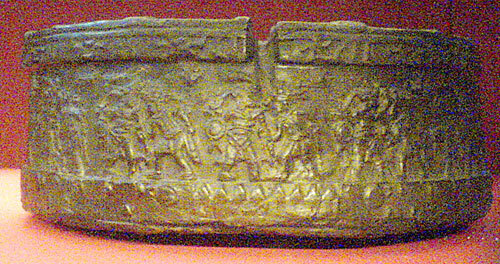 A possible clue can be found in the Enlightenment Gallery of the British Museum, where - in the ‘Ancient Scripts’ cabinet - there is a smaller (8”-9” diameter) wax model of the Tizoc Stone. It could well have been made for William Bullock, a 19th. century traveller, naturalist and antiquarian. 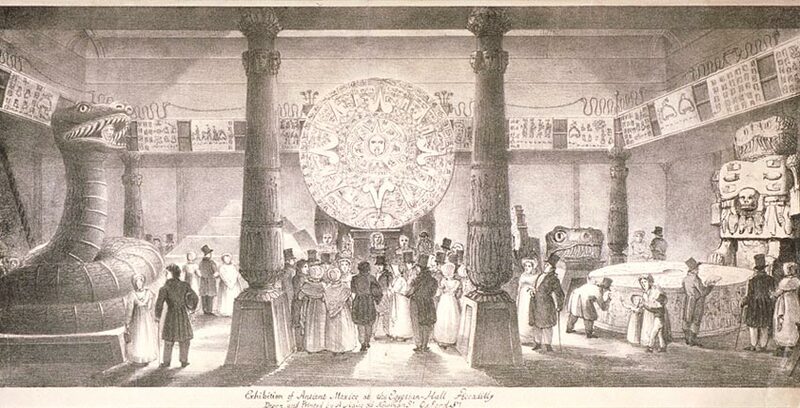 In 1823 Bullock went to Mexico and brought back a large collection of artefacts and specimens that included casts of several important Aztec treasures, which formed a new exhibition in the ‘Egyptian Hall’, Piccadilly, entitled ‘Ancient and Modern Mexico’. 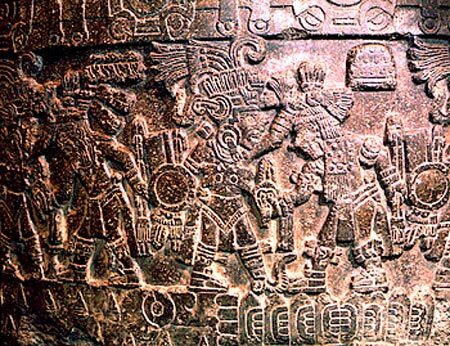 It’s since been hailed as ‘the first exhibition of pre-Columbian antiquities anywhere in the world’. 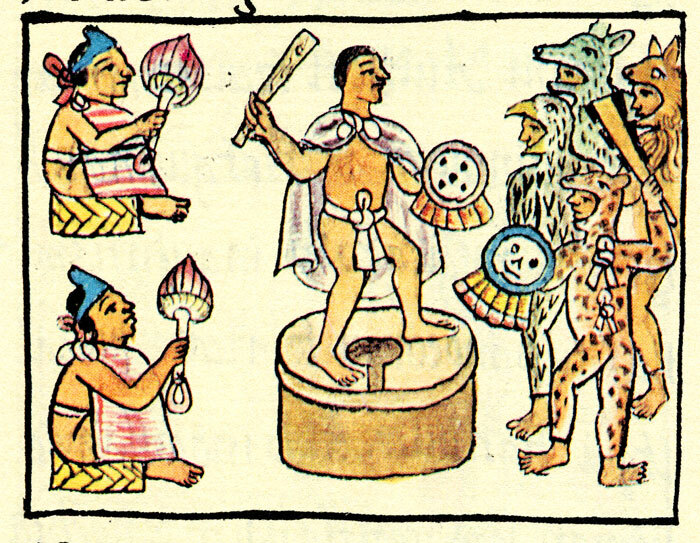 From the catalogue of his 1824 exhibition we know that he managed to have made life-size plaster casts of the famous Coatlicue statue, the Aztec Sunstone, and of the Tizoc Stone (can you see it on the right hand side of the engraving?). 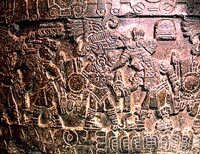 He also acquired some outstanding original pieces, including the imposing stone Xiuhcóatl (fire serpent) figure that greets visitors to the Mexico Gallery in the British Museum today (much of his collection passed to the BM in 1825). It seems likely that Bullock arranged for smaller reference copies of these major artefacts to be made, perhaps for his own collection. What of the original (note its size in the photo, bottom right)? 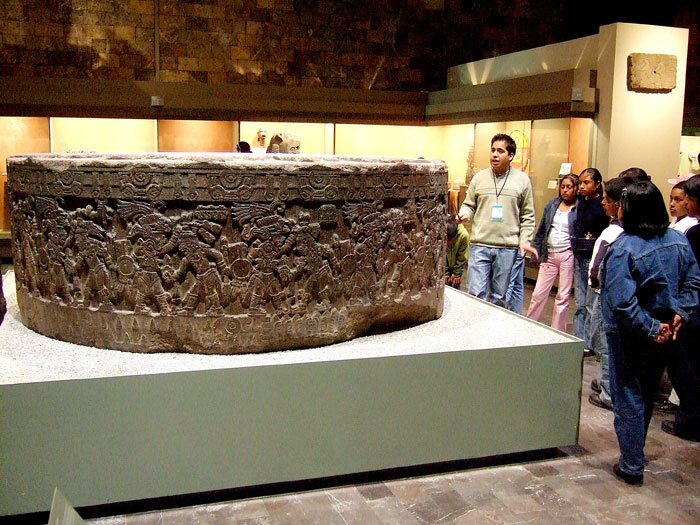 It was found buried under Mexico City in 1791, just months after the great Sunstone was unearthed. It was the first ‘temalácatl’ or ritual solar monument to be discovered by Mexican archaeology. 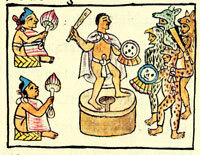 In Náhuatl the word simply means ‘round stone’, but the term today covers the famous circular stones used in gladiatorial performances (these had a crosspiece attached on which to tie the white cord that held the prisoner) as well as large monumental altars celebrating military triumphs, of which the Tizoc Stone is a prime example. 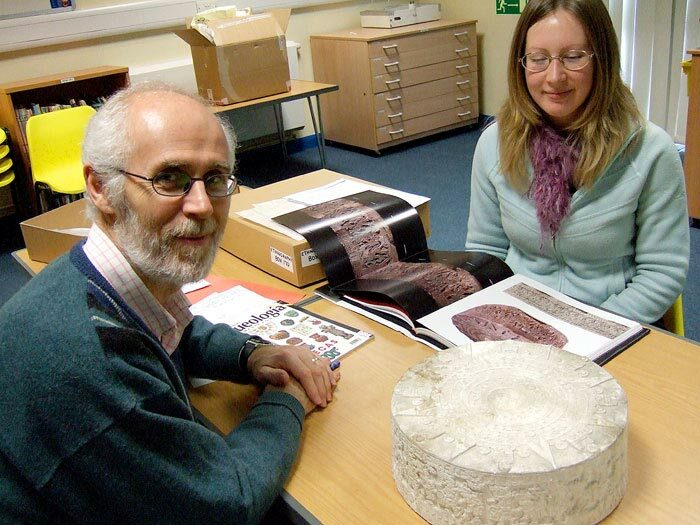 This confirms, once more, the great importance of replicas for educational purposes. Good article. What an incredible work of art. Mexicolore replies: Thanks Mario for taking the trouble to write in.